Chalet Runca is a beautiful Meissen Style Traditional chalet where the interior offers all the amenities of modern life. It has it's own garden, mountain views, fireplace, sauna, and large balcony and is the ideal holiday location in Winter and Summer for outdoor sports and activities. The Chalet is offered on a self catering basis due to popular demand. The kitchen is well equipped and easy to use. 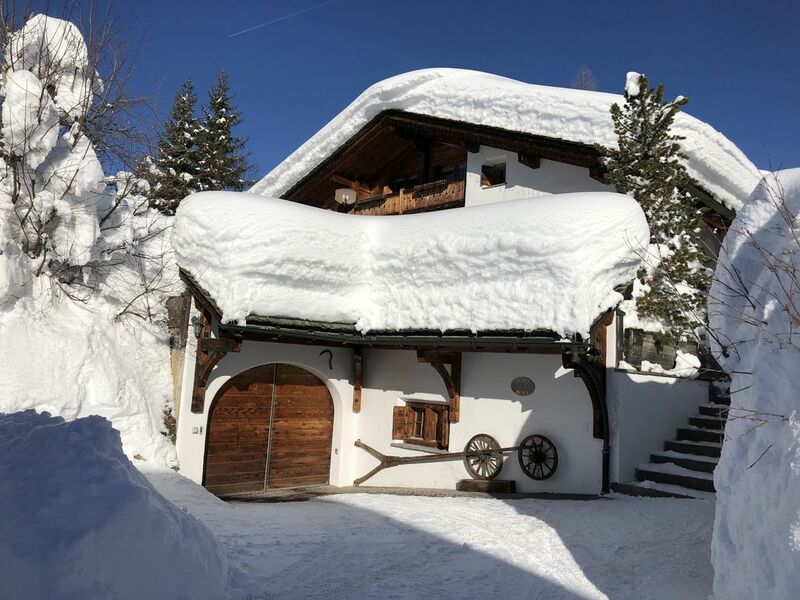 Chalet Runca is four star superior ski accommodation offering a perfect 'home from home' for three generations of family or a group of friends or colleagues. Enjoy a peaceful location with panoramic mountain views and near forest walks, ski pistes and the free resort bus service, taking three minutes to ski lifts and shops. Formal dining room seating twelve and informal dining in kitchen for eight. Top Floor: 3 Bedrooms/2 Bathrooms (with third shower room down the steps to the first floor) - Master Bedroom with en suite bathroom, two double rooms sharing a shower room. First Floor: Kingsize Bedroom, 1 WC/shower/sink room, Dining area for twelve (15 m. sq. ), Kitchen with dining for eight (25 m. sq. ), large south facing balcony with seating & night light. Ground Floor: 2 Bedrooms/2 Bathrooms/Sauna and Steam room/ Bedrooms 5 and 6, each with en suite shower room. Mike & Helen are English and have lived and worked in the Alps for twenty years. Their children were born in France and are at the local school in Arosa, enjoying all the mountain activities it offers. Chalet Runca is made of high quality materials. It is spacious, homely and in the heart of a high altitude ski resort. Arosa is vibrant and attracts all ages. Arosa has an hourly rail service from Zurich International Airport, exceptionally clean air, high sunshine hours and high snowfall records. Because of this, it developed as a holiday resort over one hundred years ago and the railway was constructed to reach 1800m. The mountain views are great from the chalet and it enjoys a very sunny, peaceful location, yet very close to the town & sporting amenities. walk-in power shower in sauna/steam room. In the heart of Arosa with ski bus just 20 metres and 500m to ski lifts, swim lake only 100m from the chalet and town 300m by foot path. Whilst being on a quiet residential road at the start of many walking trails, the Chalet is a few minutes walk or bus ride from town amenities, train station and sports facilities. In a privileged sunny location with panoramic mountain views including views of two Ski Lift Summits. Home Route meets road 150m from Chalet Runca, and after fresh snowfall, before the pavements are gritted, you can ski to the garage doors. Subject to availability on arrival, the charge is 50 chf per week per car. There are Tesla and Universal Electric Car Charging. Wifi is high speed with 140 cablecom tv channels, netflix and youtube on the sony 75" smart tv. We have a range oven, microwave/oven, and gas/electric hobs. We also have an authentic pizza oven which works really well. Spices and condiments available, bottled water is not necessary as we have excellent ice cold spring tap water. Well-equipped with stone work surfaces and octagonal Table seating 8. Groups have the choice of dining in the kitchen around a pine octagonal table, or around the oak dining table. 225km linked pistes, We provide In house ski & boot rental and are available for Ski Lessons. 17 CHF per hour rental in summer. Indoors, 30 CHF rental in winter. At Golf Club Arosa - 18-hole, 5 minutes by free resort bus. For plenty of sunshine walks amongst the lakes, mountains and forests, with benches with views along the way. Ski, snow-shoe, balcony sunlounging..you can be as active or as restful as you like. The chalet is large and very well equipped with lots of toys, videos etc for the children. Our party had 6 adults and 5 children (1*1, 3*3 and 1*8) and had loads of room. Bus is outside door but infrequent outside main season (started 20th December). Village is lovely and an easy walk. The hosts/owners are very very helpful. Although the snow was not great (but better than most) we had a super holiday. Thank you for your informative and complimentary review. It was a pleasure to meet you and your family before Christmas. Although the pistes and ski lifts were open from the 30th November this winter, it was not the usual amounts we have come to expect. It was great that you didn't let it spoil your holiday. We have been lucky with the snow this season as most European resorts could not open for Christmas, and it is still falling now on wintry days in March - snow coming from the north consistently settles from October until May here at 1800m, and the modern snow cannon system provides a reassuring back up. The snow sure winter history and year-round non-commercial feel here are major reasons why we moved our chalet business and family life here, and are still loving living and working in the mountains twenty years on. During the main season Dec 20 - 6 April, the free resort bus comes by our private road every twenty minutes. Before and after that they run hourly, but on time. We do now have a VW 4x4 seating 9 and have been popping guests to ski school and the station when requested and more convenient than waiting for the bus. I hope this benefits you next time. This winter we have enjoyed some involvement with our self catering guests be it requests for ski guiding guests over to Lenzerheide or toboggan touring, snow clearing, and providing services such as morning babysitting, as well as the usual same day personal laundry and in-house ski hire (like for like as the rental shops but a better price with helmets included). Otherwise, we are still offering our winter catered chalet product to those wishing to have set meal-times and a break from the kitchen & cleaning, not to mention a log fire set up each day and steam room refreshed. We hope you return as there is always something to do here in the fresh alpine air & amongst nature for three generations of family. Summer is amazing also! When the snow goes, a stunning region is revealed, with plenty to do and entertain the family. It is a great pleasure when guests return and we try to make it even more welcoming so you really feel it is your second home. Greetings and best regards from Helen & Mike. Graubünden is largely mountainous & sometimes referred to as 'Switzerland's holiday corner' or the 'land of the 150 valleys' - not to mention the canton's 600 lakes. Arosa grew as a health resort as it has high sunshine hours and clean air amongst stunning mountains, meadows, forests, lakes, streams. With good access via road & rail, it is a popular region for winter skiing but also running, hiking, & biking. With regular events & excellent transport system, facilities & amenities, Arosa is a gem to discover. This year the Rhaetian Railways not only celebrate their 125-year of existence, but also the 100-year anniversary of the Chur-Arosa train. The Arosa train was a pioneering achievement. During one hour of train ride 1155 metres of altitude metres are climbed (an average ascent of 60 per mill), 52 bridges and viaducts are crossed and 19 tunnels and 12 galleries are passed.